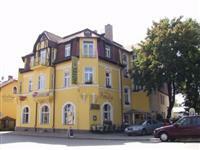 The Sonata Hotel Marianske Lazne is located in a quiet and residential area of the town. Guests are only a short drive from such attractions and destinations as the Singing Fountain, the Spa Colonnade, and the many springs that bring so many visitors to the area. The Sonata Hotel Marianske Lazne is located at Plzenska 97/2 and is roughly 20 miles from the Karlovy Vary International Airport. Each guestroom is supplied with cable TV service, a beverage station and hospitality tray, a hair dryer, a large private bathroom, high-speed Internet access, direct dial phone service, a personal safe, and room service. Those staying at the hotel will be able to rely on the many amenities which include the 24-hour front desk service, a full-service spa with massage and beauty treatments, child care options, pet friendly policies, a sauna, a tour desk service, banqueting facilities, a currency exchange, an in-house restaurant specializing in regional specialties, free parking on the premises, and a business service center.